Good nutrition is important for good health & can help protect against many diseases later in life. However, one important nutrient many kids & teens don't get enough of is calcium, found mainly in milk & dairy products & in dark green, leafy vegetables & foods with added calcium. Calcium is a nutrient that helps to make bones & teeth strong & healthy. It's used in building bone mass & also helps to reduce the risk of bone fracture due to osteoporosis, a condition where bones become fragile & can break easily. How Do We Build Strong Bones? Our bodies continually remove & replace small amounts of calcium from our bones. If your body removes more calcium than it replaces, your bones will become weaker & have a greater chance of breaking. But by getting the recommended amount of calcium, you can help your bones stay strong. Calcium needs are highest during the childhood & teen years, because bones are growing fast then & calcium must be added into bones to make them strong. Most of the calcium that makes bones strong is added by the age of 17. By eating & drinking foods that are good sources of calcium, children & teens can help store this important nutrient in their bones for later in life. As adults, we lose calcium. The more calcium that's in the bones when loss begins, the less likely it is that bones will become fragile & fracture easily. teens & young adults, ages 9-18, need more calcium because their bones are growing more than at other times of life. They should have 1,300 mg of calcium per day, or about 3 servings of Milk Group foods daily. One 8-ounce glass of milk has about 300 mg of calcium, so just a few glasses can go a long way towards getting the calcium needed each day. How Do I Know How Much Calcium a Food Has? Food labels can tell you how much calcium is in one serving of a food. Look at the % Daily Value (DV) next to the calcium number on the food label. Try to eat & drink foods with 20% or more DV for calcium (like milk). These foods are good sources of calcium. Foods with less than 5% DV for calcium only give you a small amount of what you need each day. For most adults, 100% DV = 1,000 mg of calcium. But children ages 9-18 need extra calcium. This age group needs 1,300 mg (130 DV), an additional 300 mg of calcium each day. That means an extra 8-ounce glass of milk or extra servings of another calcium-rich food. How Much Calcium Do Kids Get? Unfortunately, most children & teens don't meet calcium recommendations. 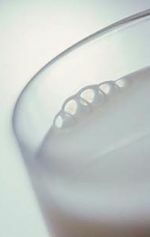 National nutrition surveys show that only 19% of teen girls & 52% of teen boys get the recommended amounts of calcium. In fact, teenage girls only average about 740 mg of calcium per day, well below the amount needed for their normal growth & development. Low-fat & fat-free milk & dairy products, such as cheese & yogurt, are excellent sources of calcium. In addition to having lots of calcium, milk & dairy products provide other essential nutrients, all necessary for good bone health & development. Fat-free (skim) & low-fat (1%) milk & dairy products are excellent choices because they make it easy to get enough calcium without adding a lot of extra fat & saturated fat to the diet. e.g., a glass of whole milk contributes 25% (1/4) of your total saturated fat for the day, while a glass of low-fat milk contributes only 7.5% of the total saturated fat. There are now a variety of milk products available including different levels of fat & even different flavors but an 8-oz glass (1 cup) of any variety still contains about 300 mg of calcium. However, babies under 1 year old should drink only breast milk or iron-fortified formula. Children ages 1 - 2 should drink whole milk rather than reduced fat varieties because some fats are necessary for their early growth & development. Lactose, the sugar found in milk & dairy foods, can cause abdominal discomfort in some people. A person with lactose intolerance has trouble digesting lactose. Lactose intolerance is not common among infants & young children, but can occur in older children, adolescents & adults. It's more common among people of African-American, Hispanic, Asian & American Indian & Alaskan Native descent. For people with lactose intolerance, milk is often better digested when drunk in small amounts & when combined with other foods, such as cereal with milk. In addition, many people can eat dairy foods such as cheeses or yogurt, which cause fewer symptoms. Recent studies also show that many people who are lactose intolerant can drink 2-3 8-oz glasses of milk each day without getting any symptoms. Also, lactose-free milk products are now available in most stores & there are pills & drops that make it easier to digest milk & dairy products that have lactose in them. Some people, however, are allergic to milk & dairy products & shouldn't eat them. For those people who can't have any milk, calcium can come from non-dairy sources like dark green, leafy vegetables such as kale, or foods like broccoli, lime-treated tortillas & tofu processed with calcium. There are also foods with added calcium, such as calcium-fortified orange juice, soy beverages & some cereals. Getting calcium from food is recommended, but calcium supplements can also be a way to add necessary calcium. Getting enough calcium is important for building strong bones & ensuring future health. Here are 3 things you can do to help get enough calcium & keep bones & teeth strong. Think of ways to incorporate milk & other calcium rich foods into meals & snacks. For example, top a baked potato with broccoli & low-fat cheese, or dunk baby carrots into low-fat yogurt dip. Keep foods with calcium in the house & put them on the table during meals & snacks. Keep drinking milk throughout your life & be sure to eat & drink other foods with calcium. These foods should be an important part of the diet your whole life long. (HealthDay News) - Calcium is a necessary mineral to build & preserve strong bones, strong & healthy teeth & healthy muscles & tissues. Plenty of calcium at a young age - particularly in adolescence - is very important to protecting bones later in life & preventing osteoporosis. Bone mass continues to grow until about age 30 or 35. Calcium in milk, cheese, yogurt & other dairy products will help build bone mass. The mineral can also be found in leafy green vegetables, dried beans & fruits & nuts like almonds. Because the cells in bones are constantly being destroyed & reproduced, the body needs to take in more calcium than what it processes. If enough calcium isn't consumed, more bone tissue is destroyed than is created & bones are weakened. The Harvard School of Public Health recommends about 550 milligrams of calcium per day, but that quantity can vary by age. The recommendation is 1000 milligrams a day for people between the ages of 19-50 & 1,200 milligrams a day for people aged 50 & older. Why the concern about calcium in the diet? The average intake of calcium for women is 400 mg per day & the recommended intake is 800 mg per day. Low intake over a lifetime may lead to osteoporosis (brittle bones). Calcium is found in dairy products, calcium-fortified foods (e.g., some orange juice & breakfast cereals), legumes, greens, fish where the bones are eaten (canned sardines, salmon & mackerel), tofu (bean curd), & dietary supplements. The most concentrated natural source of calcium is milk. Why is the intake of milk so low? Many adults don't drink milk because they don't like the taste are lactose intolerant (it gives them gas & makes them feel bloated) feel it's "for kids only" &/or feel milk has too many calories. What are the alternatives to drinking plain milk? If plain milk gives you gas because you are lactose intolerant, try using one of the lactose digesting products on the market (Lactaid®, Dairy Ease®). You can buy fresh lactaid milk with extra calcium. Use cheese-There are many lowfat (e.g., Kraft Light Naturals® and "Philly" Light®-a Neufchatel cheese) and nonfat (cottage, cream, Alpine Lace® brand) cheeses. Eat cheese plain or combine it with other foods where it calls for traditional cheeses. If a thicker product is desired, drain the yogurt by placing it in a coffee filter & strainer over a bowl in the refrigerator for 12 to 24 hours. Use frozen yogurt for dessert instead of ice cream. Most recipes will tolerate 1/4 to 1/2 cup dry milk added. Serving size portions may take 1/2 to 1 tablespoon. When simmering bones to make soup stock add 1 to 2 tablespoons of vinegar to the pot. This will dissolve a small amount of the calcium from the bones & leave it in the meat broth. Use a dietary supplement of calcium, with or without vitamin D added, or a general vitamin-mineral supplement containing calcium. Make sure the calcium supplement will disintegrate properly by placing it in 6 ozs. of vinegar for 30 minutes. If it disintegrates your body will be able to absorb the calcium in the pill. Calcium is responsible for building & maintaining healthy bone mass & preventing osteoporosis. Until age 35, you need to get plenty of calcium so your growing bones become as dense as possible. Just 5% extra bone density can lower your risk of osteoporosis by more than 40%. For older women, an ample supply of calcium helps maintain existing bone mass, cutting in 1/2 your risk of hip fractures. Calcium isn't just great for bones. New research shows that it may help reduce PMS symptoms such as bloating & moodiness, & it may even stave off extra weight. In a 2 year study at Purdue University, young women getting 1,000 milligrams of calcium a day gained 6 pounds less body fat than women on low-calcium diets. Calcium helps muscles contract, blood clot & your body maintain normal blood pressure. those 60 & older get just roughly 1/2 of their recommended daily allowance, averaging 667 mg, according to the Centers for Disease Control & Prevention's 2002 report on Americans' dietary intake - YIKES! The pictures are frightening. Porous, fragile bones. Broken hips & hunched backs. A lack of calcium may result in the bone thinning disease osteoporosis, which affects older American men & women. Osteoporosis is a condition of gradually weakening brittle bones. As bones lose calcium & other minerals, they become more fragile & porous. Osteoporosis is the cause of more than 1.5 million bone fractures each year. These fractures often lead to permanent changes in lifestyle. Calcium is a key ingredient in maintaining good bone health & slowing bone loss later in life. Calcium is the most abundant mineral in the body. It plays two important roles. First, it' an essential part of bone structure. Second, bone calcium serves as a reservoir that releases calcium to the body fluids when there's a drop in blood calcium concentration. Calcium in body fluids plays several important roles including maintaining normal blood pressure & nerve transmission. The establishment of recommended intakes for calcium is difficult because absorption varies not only with age, but also with a person's vitamin D status, the calcium content of the diet & calcium binders in foods. In general, calcium recommendations are high for young people & for those over age 51 because calcium absorption declines with age. can also help meet calcium needs. The final option is a calcium supplement. For best absorption choose products containing calcium citrate or calcium caltrate. Avoid calcium supplements with dolomite or bone meal. They may contain very small amounts of lead & other metals. In addition, avoid calcium-containing antacids that contain aluminum & magnesium hydroxide, which cause calcium loss. Remember to drink plenty of fluids with calcium supplements to avoid constipation. Consider however before reaching for that supplement that the American Society for Bone & Mineral Research recommends foods as a source of calcium in preference to a supplement. In addition to calcium intake, weight-bearing exercise like walking, jogging & ballroom dancing helps keeps bones dense. No matter what your age, making choices to keep your bones healthy is the right decision. Brittle bones, caused by osteoporosis, is something all of us need to be aware of and avoid as we grow older. Osteoporosis is a disabling disease that takes decades to develop. Without proper diet and exercise, osteoporosis causes bones to gradually become fragile and weak. The National Osteoporosis Foundation reports that one half of women and 1 in 8 men over age 50 will suffer a bone fracture due to osteoporosis. Currently, this frightening disease affects 28 million people in the United States, with 80% of the cases occurring in women. About 24% of these hip fracture patients will die within a year of their fracture. The focus of this article is about calcium -- how much you need and good dietary sources to obtain it. The optimal calcium intake for most adults age 25 to 65 is 1,000 mg per day. The exception is postmenopausal women who are not taking estrogen -- they require 1,500 mg per day. Regardless, by age 65, all adults should get 1,500 mg of calcium per day. Calcium is one of the cornerstones of osteoporosis prevention. Talk to your doctor about your specific calcium needs as well as other ways you can prevent osteoporosis that are specific to you. The best way to get calcium in your diet is by eating & drinking a variety of dairy products including milk, cheese & yogurt. As an example, you'd need to drink about 4 glasses of milk a day to receive the calcium recommended by the National Osteoporosis Foundation. Other products which are rich in calcium that you should consider are broccoli, fortified oatmeal, dried figs, calcium-fortified orange juice, Kellogg's Eggo frozen waffles & calcium enriched V-8 juice. 8 oz. glass of skim milk 300 mg.
1 slice of American cheese 100-150 mg.
8 oz. serving of non-fat cottage cheese 50 mg.
8 oz. serving of non-fat yogurt 450 mg.
1/2 cup of cooked broccoli 47 mg.
1 serving of fortified instant oatmeal 215 mg.
1/4 cup of dried figs 72 mg.
2 Eggo frozen waffles 300 mg.
10 oz. glass of calcium enriched V-8 juice 325 mg.
1 Kellogg's Nutrigrain Cereal Bar 200 mg.
Getting your calcium by foods is more preferable than taking supplements since calcium benefits vary by supplement & some of us may have the tendency to take them sporadically. But as the name implies, supplements can help on those days when you haven't gotten enough from the foods you eat. An average calcium supplement contains 600 mg. of calcium. Be sure to take them on a daily basis however. In addition, a daily vitamin D supplement will help your body absorb the calcium that it needs. In fact, some supplements contain vitamin D in addition to calcium to aid in this absorption. Wherever you decide to get your calcium, don't delay. Most people think osteoporosis can be cured at any age without drugs. The truth is, you really need to prevent it beginning in childhood. Osteoporosis: A debilitating disease that can be prevented & treated. Osteoporosis is a disease in which bones become fragile & more likely to break. If not prevented or if left untreated, osteoporosis can progress painlessly until a bone breaks. These broken bones, also known as fractures, occur typically in the hip, spine & wrist. Any bone can be affected, but of special concern are fractures of the hip & spine. A hip fracture almost always requires hospitalization & major surgery. It can impair a person's ability to walk unassisted & may cause prolonged or permanent disability or even death. Spinal or vertebral fractures also have serious consequences, including loss of height, severe back pain & deformity. Millions of Americans are at risk. While women are 4 times more likely than men to develop the disease, men also suffer from osteoporosis. Definition: Osteoporosis, or porous bone, is a disease characterized by low bone mass & structural deterioration of bone tissue, leading to bone fragility & an increased susceptibility to fractures, especially of the hip, spine & wrist, although any bone can be affected. Prevalence: Osteoporosis is a major public health threat for an estimated 44 million Americans, or 55% of the people 50 years of age & older. In the U.S. 10 million individuals are estimated to already have the disease & almost 34 million more are estimated to have low bone mass, placing them at increased risk for osteoporosis. Of the 10 million Americans estimated to have osteoporosis, 8 million are women & 2 million are men. While osteoporosis is often thought of as an older person's disease, it can strike at any age. 20% of non-Hispanic white and Asian women aged 50 & older are estimated to have osteoporosis & 52% are estimated to have low bone mass. 5% of non-Hispanic black women over age 50 are estimated to have osteoporosis; an estimated additional 35% have low bone mass that puts them at risk of developing osteoporosis. 10% of Hispanic women aged 50 & older are estimated to have osteoporosis & 49% are estimated to have low bone mass. Osteoporosis is under-recognized & under-treated not only in Caucasian women, but in African-American women as well. 20% of those affected by osteoporosis are men. 7% of non-Hispanic white & Asian men aged 50 & older are estimated to have osteoporosis & 35% are estimated to have low bone mass. 4% of non-Hispanic black men aged 50 & older are estimated to have osteoporosis & 19% are estimated to have low bone mass. 3% of Hispanic men aged 50 & older are estimated to have osteoporosis & 23% are estimated to have low bone mass. 1 in 2 women & 1 in 4 men over age 50 will have an osteoporosis-related fracture in her/his remaining lifetime. 250,000 wrist fractures & 300,000 fractures at other sites. Hip fracture risk is increasing most rapidly among Hispanic women. Women with a hip fracture are at a 4-fold greater risk of a second one & the risk factors are similar to those for the first hip fracture. Osteoporotic fractures lower a patient’s quality of life. Symptoms: Osteoporosis is often called a "silent disease" because bone loss occurs without symptoms. People may not know that they have osteoporosis until their bones become so weak that a sudden strain, bump or fall causes a fracture or a vertebra to collapse. Collapsed vertebrae may initially be felt or seen in the form of severe back pain, loss of height, or spinal deformities such as kyphosis or stooped posture. Risk Factors: Certain people are more likely to develop osteoporosis than others. Factors that increase the likelihood of developing osteoporosis & fractures are called "risk factors." Women can lose up to 20% of their bone mass in the five to seven years following menopause, making them more susceptible to osteoporosis. Medicare reimburses for BMD testing every two years. An increase in BMD testing and osteoporosis treatment was associated with a decrease in hip fracture incidence. Bone density is an important determinant of fracture risk even in nursing home patients. There has been a 5-fold increase in office visits for osteoporosis (from 1.3 to 6.3 million) in the past 10 years. Prevention: By about age 20, the average woman has acquired 98% of her skeletal mass. Building strong bones during childhood & adolescence can be the best defense against developing osteoporosis later. There are 5 steps, which together can optimize bone health & help prevent osteoporosis. A study of disease management in a rural healthcare population demonstrated that a preventive program was able to reduce hip fractures & save money. The most typical sites of fractures related to osteoporosis are the hip, spine, wrist & ribs, although the disease can affect any bone in the body. The rate of hip fractures is 2 to 3 times higher in women than men; however, the 1 year mortality following a hip fracture is nearly twice as high for men as for women. A woman's risk of hip fracture is equal to her combined risk of breast, uterine & ovarian cancer. In 2001, about 315,000 Americans age 45 & over were admitted to hospitals with hip fractures. Osteoporosis was the underlying cause of most of these injuries. An average of 24% of hip fracture patients aged 50 & over die in the year following their fracture. 1 in 5 of those who were ambulatory before their hip fracture requires long-term care afterward. At 6 months after a hip fracture, only 15% of hip fracture patients can walk across a room unaided. Not just hip fractures, but vertebral fractures are also linked with an increased risk of death. 1 in 5 hip fracture patients ends up in a nursing home, a situation that participants in one study described as less desirable than death. White women aged 65 or older have twice the incidence of fractures as African-American women. Alendronate is approved as a treatment for osteoporosis in men & is approved for treatment of glucocorticoid (steroid)-induced osteoporosis in men & women. Risedronate is approved for prevention & treatment of glucocorticoid-induced osteoporosis in men & women. Parathyroid hormone is approved for the treatment of osteoporosis in men who are at high risk of fracture. Treatments under investigation include sodium fluoride, vitamin D metabolites, and other bisphosphonates & selective estrogen receptor modulators. calcium - you are here! With their bumblebee-colored uniforms & powerful kicks, the 10-year-olds pounding up a Washington, D.C., soccer field one sunny spring Saturday seem the picture of fitnessnot future stress fractures & bone woes. But check out the Gargoyles' calcium consumption. 3 of the 10 girls shun milk because it tastes "ee-yew." Several others drink it only when it's put before them. Rachel, alone, downs the recommended four glasses a day. "I come from a family with a long history of osteoporosis," she says. "My mom wants me to break the cycle." Scores of youngsters risk being benched by the same vicious vortex if they don't start boning up on calcium, nutritionists warn. Some 44 million Americans, more than half the population age 50 or older, especially women past menopause suffer from osteoporosis or low bone mass, a new survey from the National Osteoporosis Foundation shows. The same study predicts that the number could hit 61 million by 2020 & keep climbing if today's preteens & teenagers don't adjust their diets. A key step: ditching soda for milk or calcium-fortified drinks. Even that shift "is a very difficult sell" for adolescents, who can't see investing in a "bone bank" that pays such distant dividends, notes University of California-Los Angeles pediatrician Loraine Stern. Yet teens need calcium more than any other age group. About 90% of bone mass is established by age 17; it peaks at about 21 before eroding. Girls face greater risk because overtraining or eating disorders can halt menstruation, reducing the estrogen needed to build bones. "These truly are make it or break it years," says Paul Collins, a physician with the American Academy of Orthopaedic Surgeons. Deficit spending. Despite efforts to combat the "calcium crisis," including those "Got Milk?" mustache ads, teen diets remain dangerously deficient. Just 2 in 10 girls & 5 in 10 boys ages 9 to 19 get the recommended 1,300 mg per day of calcium. Most take in just 800 mgabout 2.5 glasses' worth of milk. Yet parents can make a big difference by serving calcium at every meal; the body absorbs only 500 mg of calcium 2 slices of cheese pizza at a time. Experts still consider milk the best source. For variety, try chocolate milk, advises American Dietetic Association spokesman Jeff Hampl. The mineral content is worth the sugar trade-off, he says & the cocoa powder adds fiber. Milk is the drink of choice at Hewes Middle School in Santa Ana, Calif., where students bypass the cafeteria cartons for a $1.25 "chug" of strawberry, chocolate, or plain from a vending machine that pictures skateboarding legend Tony Hawk. "If kids think it's cool, they do it," says Principal Margie Sepulveda. Got milk issues? Markets brim with alternatives. Pediatrician Stern gives thumbs up to calcium-fortified orange or apple juice. Nutritionist Hampl recommends fortified soy or rice milk & cereals like Total. New calcium-laced candies are OK.
Recognizing a calcium gap often is key to closing it. Gargoyles parent Emily Spitzer dishes up such milk treats as frappuccinos & shakes, buys calcium-fortified orange juice & insists on a daily calcium pill. What to serve at the team's end-of-season bash? Cheese pizza, of course. Are you dieting your way to bone loss? Are you aware that the diet you follow may be depleting your bones of essential nutrients & increasing your chances of developing osteoporosis? Popular diets may promise quick weight loss, but calcium & other important nutrients are often missing from the menu, which can lead to bone loss. The study looked at the eating behavior of women between the ages of 18 & 50 & found that those classified as "restrained eaters" had significantly lower bone mineral density & bone mineral content (key indicators of overall bone strength & health) than women who said they weren't concerned about what they ate. "Exercise & eating a well-balanced diet with adequate calcium, are two of the best ways to keep your bones strong & healthy." advise the researchers. Calcium isn't only good for your bones but can help you maintain a healthy, low fat diet too. There has been increasing media coverage about numerous studies showing that a diet rich in calcium helps reduce body fat. Why is calcium important in weight loss? Calcium is a fat burner. High-calcium diets seem to favor burning rather than storing fat. Researchers say this is because calcium stored in fat cells plays an important role in fat storage & breakdown. Previous studies have shown that a higher calcium intake can block body fat production in adults & preschool children (7), but this was one of the first studies to show that it might have the same effect in body-conscious preteen & teenage girls. But aren't dairy products fattening? Some dieters consider dairy products to be fattening, but the evidence suggests the opposite is true. Consumption of calcium-rich dairy foods can actually help to reduce & prevent obesity. Over 20 recent studies show that milk products actually contribute to weight loss. The study provided clinching evidence that calcium in low-fat dairy products can help adjust your body's fat-burning machinery & help keep your weight under control. Why does diary calcium work so well? Researchers believe that other nutrients found in milk products act in synergy with calcium to reduce fat more efficiently. Foods that are a good source of calcium include cheese, milk, ice cream, baked beans & other dried legumes, dried figs, broccoli, most dark-green leafy vegetables & soft fish bones like those in canned salmon. Disclaimer: If you're under 18, pregnant, nursing or have health problems, consult your physician before starting any weight loss plan. The information here isn't provided by medical professionals & isn't intended as a substitute for medical advice. Please consult your physician before beginning any course of treatment. Get Kids Thinking about Calcium - Build a Bone Building Scoreboard. To get the calcium they need from milk, kids must drink at least 3 glasses everyday. But with milk being replaced by sodas & other nutrient-void beverages, nearly 50% of kids in the U.S. aren't getting enough calcium in their diets. So what can you do to help your children get enough calcium? One way is to get them thinking about calcium & its benefits. i.e., do they know that calcium helps their bones grow stronger & ultimately more resistant to fractures? But it doesnt stop there. Calcium also helps their teeth & gums stay healthy & aids in muscle contraction & nerve function. So teach your children about calcium by building a Bone Building Scoreboard with them. You'll help teach them about the importance of calcium & encourage them to make smarter food & drink choices down the line. On a large poster board, make a list of everyone in your home who needs calcium. To make it fun, you can even draw pictures of healthy bones and teeth. Explain to your children why they need calcium for strong bones and where they get calcium. We've provided a list of a few foods that are excellent sources of calcium. Every time a family member has a calcium-rich food they get a star. When they drink milk with dinner, eat some cheese and crackers as a snack or a cup of yogurt for breakfast they get a star. Ice cream, cottage cheese and frozen yogurt count, too. At the end of each week, the family member with the most stars receives a fun gift that the family picks out. The idea is to make it fun for your children to learn about calcium, so have a good time with it. Let your children decorate it as they want to and make it their own. Plus, have your children monitor the chart and award the stickers. They'll feel more in control and thus, become more involved. Its a fun activity to help your children learn and grow! 1 National Institute of ChildHealth and Human Development; Physical Activity and Bones. 2 National Center for Chronic Disease Prevention and Health Promotion; Why Should I be Active? Over-and-Under Fun: Build an obstacle course with your children Help your children set up a small obstacle course in your back yard or nearby park and invite their friends over to try it out. Use your imagination with the obstacles and be sure to have your children help set up the course. If a yard or park isnt readily available, set up a smaller course in your living room or throughout your house or apartment using couch cushions, pillows, shoe boxes, etc. Remember to keep the course safe. Make sure the obstacles and surrounding objects arent dangerous or sharp, and avoid heights above a couple of feet to prevent injury from a fall. Keep a stopwatch on hand and help them keep track of their times. Encourage participation rather than competition the idea is to let your children have fun, get some exercise and feel good about themselves. Afterward, reward them all with an assortment of healthy beverages and tasty snacks like calcium-rich nesquik hot cocoa. Cardboard Boxes- Get some old produce boxes from your local grocery store. Theyll usually give them for free. These versatile, sturdy boxes can be used for all sorts of things in your childrens obstacle course. Decorate them with your child for an added element of fun. Stagger them on the lawn so your children can run thru them in a zigzag pattern. Open up the bottoms and tape several boxes together to make a tunnel to crawl thru. If you have enough boxes, make the tunnel twist and turn a little. At one point in the course, set up a box as a make-shift basket for your child to toss a ball into. Rope- Its versatile, reusable, and makes a great addition to your course. Tie several pieces of it into 10-12 circles and set them in a row on your lawn. Have your children hop on one foot to make it thru them. Place a couple of the circles side by side for a makeshift hop-scotch section. Place 2 8-10 lengths of rope parallel on your lawn about 4 inches apart & have your children walk its length like a balance beam. Broomstick: set up a limbo stick for your children. Use boxes of varying size, the backs of chairs as supports, or just hold it for your children to give them a fun challenge. With a little imagination & creativity, you & your children can put together a fun course for next to nothing. But although the course is free, the healthy rewards are invaluable. *These sea vegetables are now available in most whole-food stores. In this chart, their calcium content is based on dried samples. 7. The Solanum genus of vegetables. Tomatoes, potatoes, eggplant, & bell peppers contain the calcium inhibitor solanine. Learning the true nutritional values of the food we eat, as well as educating ourselves about the problems our bodies can encounter if we don't eat properly is just a new way to begin thinking of food. Most of us think of food as entertainment, comfort and a way to take up time. Eating food is truly meant to be fuel for our bodies. We need to adopt a different belief system where our foods are concerned. This may help us reduce emotional eating. Education allows for more understanding & the more educated we are, the easier it will be to teach our children why we eat the foods we do & the importance of vitamins & minerals in the diet.